Egypt uses “fatwa” kiosks to combat terrorism or spread fundamentalism? The Islamic kiosk program is the opposite of reform. 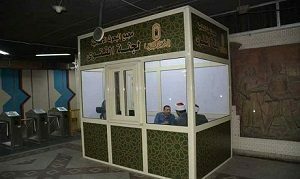 For the past two weeks in Cairo, a resistance movement has been gaining momentum against a recent transgression by Al-Azhar Institute to insert newly constructed taxpayer-funded “fatwa” (edict) kiosks into every subway stop in the city. The trial began in one of the busiest subway stations — overcrowded and overwhelmed with chaos — where The Islamic Research Center under the auspices of Al-Azhar Sunni Institute placed its first kiosk. Acting outside the law that requires permits to construct and install kiosks, the Center plans to install in each underground subway entrance and exit platform a 50-square foot glass and wood cube in which three imams sit and wait for clients to walk inside seeking answers (“fatwas”) to their personal religious questions. Bloggers wish instead for public bathrooms and more book venders. Mockers on social media say that it’s a jobs program for unemployed Imams. One protester joked and wondered if the kiosk would deliver “fresh or frozen fatwas.” But the official explanation made by the spokesman for the Egyptian Metro Company (a public entity) is that this initiative is “to combat ‘alleged terrorism’.” It is to be an initial experiment as part of the protocol signed between the taxpayer-funded Center and the public Metro Company that would include 11 hours of coverage by the “fatwas” committee in two work shifts per day. Accomplishing the ambitious goal of curbing terrorism with kiosks would require their proliferation and widespread use beyond the Cairo platforms, a potential explosion no one is talking about. No doubt kiosks will sprout up at every park, hotel, beach, and amusement area. But for now Alexandria has the only other subway system in the country to duplicate the program, and because of this much of the country’s territory would be left uncovered by the plan. Yet an even greater obstacle than this will obstruct the kiosk’s stated purpose. When a jihadist prepares to commit an act of violence, he has consulted the Quran directly, which contains the verses to confirm his impending action. This negates any need for him to visit an Imam. So what could be the real reasoning behind setting up fatwa kiosks across the city? Copts are well aware that issued edicts often alienate them from Muslims. For instance, one edict disallows Muslims from greeting Copts during Christian holidays. Another edict demands a Muslim not to return a simple greeting at any time from a Copt. Yet another forbids Muslims to say hello first to a Christian in passing. The list goes on with hundreds more edicts offending Christians and denying them the basic civilities of society. Open criticism of the program comes mostly from Muslims objecting to the spread of Islamic fundamentalism. In reaction to them, a government spokesperson said the kiosks would be temporarily placed and uninstalled by the end of the Feast of Sacrifice (less than one month). But Egyptians fear the implants are there to stay. Most believe Al-Sisi is associated with the program in spite of the fact that he has confronted Al-Azhar about renewing Islamic religious discourse in view of reform. The Islamic kiosk program is the opposite of reform. Even though the secretary general of the Center says the protocol aims to “confront the misguided fatwas coming from extreme currents” there will be much more damage to civil law offsetting any potential good. “Fatwas” overrule laws of the state. Furthermore, confronting “misguided fatwas” is a fallacy since every “fatwa” remains concurrent. It is fair to say the kiosk initiative empowers the legacy of Hassan Al-Banna (founder of the Muslim Brotherhood). The original goal of the Muslim Brotherhood was to have an Islamic presence to engage citizens with Islamic doctrine on every street corner. This kiosk plan includes providing “advocacy programs in daily metro broadcasting… by Al-Azhar preachers.” All is in the name of “presenting correct concepts of Islam focusing on religious education and moral aspects of people’s lives.” But these “correct concepts” and “moral aspects” are already increasingly used to police the population. Up until now, there has been no willingness to adjust mosque teachings, school textbooks and the media where real change can be made and little expense is required in response to the need for reform. Mosque doctrine has always infiltrated the state through the edict process with “fatwa” offices in places within government departments. “Fatwa” hotlines set up for individuals are apparently not enough now and do not obviate the need for the physical presence of public kiosks. Also, nothing has been done to regulate and permit mosque construction or eliminate the disturbing noise pollution in neighborhoods from mosque microphones. No one in their right mind can look at Egypt in this moment and claim that the Arab spring was a people’s revolution. Aside from reducing standing room for the millions of daily subway riders and obstructing the historical and cultural wall murals underground, the effort insults the secular democratic ideals held by a substantial portion of the populace whose resistance to political Islam and the influence of its sheiks and imams was made known in the uprising against Mubarak and then Morsi. Al-Sisi was supported when he stepped in with the military making clear with his talk of democracy and human rights that he would overcome the religious deep state and its intention to further Islamize the country. Over the past four years, Al-Sisi has produced more for the deep state than for the people. Although Al-Sisi has cracked down on many undesirable elements, he is far from curtailing the aggressive religious supremacy coming through from past decades. Foisting Islamic doctrine into the public domain with the kiosk program where the volume can never be turned down and the channel can never be changed to an option other than Islam will completely shut down the possibility of Intellectual and religious diversity. And that is exactly what a new anti-hate resolution currently under discussion in the corridors of the Egyptian Parliament and synchronized with the kiosk initiative is intended to accomplish. The bill, drafted by Al-Azhar, condemns anyone who writes or speaks against Islam or attempts to analyze the writings of the Islamic books. It also includes severe penalties of imprisonment and death. Even discussing Islam’s heritage and history will be suspect. As such, the bill expands upon Egypt’s current blasphemy law which penalizes speaking or writing about the Prophet, Allah and the first Caliphas.